2018 CA Summer Camp Recap – Petruescu Dominates! The 2018 Chris Sailer Kicking Summer Tour got off to a fantastic start in Los Angeles, CA on Thursday June 28th. As always, the west region of the country provided no shortage of talent. On a near perfect day in 80 degree temperature many of the nation’s best kickers and punters put on an impressive performance. Athletes from over 10 states were in attendance ranging from CA to AZ to UT to GA. Take a look at the results. 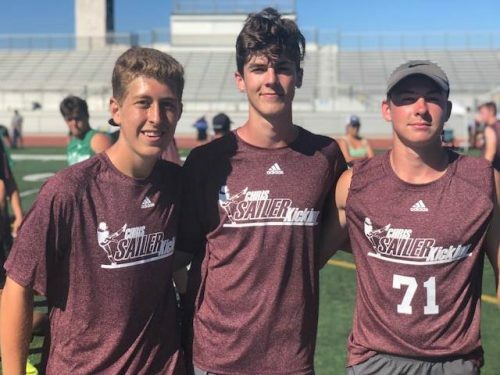 The longtime Chris Sailer Kicking Kicker had a breakthrough performance. He was absolutely on fire from start to finish. He came in to with a distinct focus and it paid off. During the morning session, he won the last man standing field goal competition and also earned a 2018 TOP 12 Wild Card spot in doing so. He also won the Kickoff Competition with a winning kick of 74 yards with 3.90 hang time. In the finals, he nailed a 50 yard field goal with ease to win it all. Brandon has proven that he can compete at any college level. He has a bright future. Everett had an impressive first camp with Chris Sailer Kicking. He kicks with excellent technique and consistency and proved very quickly that he can handle pressure. He won the field goal competition by going 7-7 with a long of 55 yards. Everett also did very well on kickoff averaging 65+ yards with 4.0+ hang time. He is a great kicker that is going to do an excellent job at the college level. Big things ahead for this talented specialist. Will continues to prove that he is one of the best combo (K/P) players in America. This was now his third straight strong showing at a Chris Sailer Kicking camp. During the morning session, he earned a TOP 12 Wild Card spot by defeating a few of the best specialists from CA head to head. He won the Punt Competition by averaging 45+ yards, with 4.4+ hang time. He is also impressive on kickoff. Will is an outstanding D1 kicking and punting prospect. I look forward to seeing what the future holds. Junior College Standouts: Ricardo Quintero, Tanner Carcama, JP Rybus, Triston Brown, Daniel Garcia. Class of 2020 Standouts: Ronan Donnelly, Sam Stephenson, RJ Lopez, Archie Green, Derek Roah, Nick Hill, Anthony Meader, AJ McCarroll, Cole Thompson, Ben Reade, Julien Ramos, Michael McCallister. Class of 2021 Standouts: Brayden Blevins, Conor Cummins, Seth Ponce, Christopher Salerno, Max Gordon, Michael DeMirjyn, Richie Brutto, Spencer Wilson.